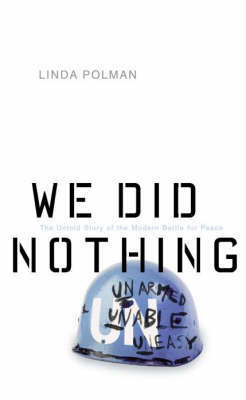 It took me a while to figure out what Linda Polman is actually trying to say in her book We Did Nothing. It was about the UN, ok, that was obvious from the start. I expected lashes and bitter complaints, which seem to be the usual reaction to this institution's proceedings whenever a conflict flares up, but no, I could detect no obvious criticism. Not much praise either, but the narrative was clearly organised along the lines of UN involvement in war zones. Somewhat perplexed, I kept on reading. I detected faint anti-American notes, but chastising the US power politics did not seem to be the main focus of the book, rather an unavoidable background detail. Straightforward war reporting then? True, stories got only more terrible as the book progressed, from besieged UN soldiers in Somalia to heart breaking poverty in Haiti, but I was sure that the author meant to transmit some message, not only series of pictures. For four fifth of the book this message was rather vague. Then I reached the last chapter and everything became crystal clear. In a way, Polman defends the UN. She recognises it as an impotent institution, but also violently rebels against expecting miracles from a body that is, by definition, powerless. If Polman is to be believed, UN is underfunded and undermanned, and also quite unfree in its actions. As she puts it, the UN cannot say no if its member states say yes. Bound by the non-intervention rule, its possibilities are seriously limited when expectations remain high. I have my doubts as to the 'underfunded' part, but I find the rest of Polman's arguments quite convincing. Compared to armed multitudes in war zones (just think of numbers involved in Rwanda genocide in 1994), numbers of UN troops are insignificant. Yet we expect them to somehow stop the atrocities, defend civilians, provide humanitarian aid and make it all better, without casualties and diplomatic mishaps. In short, we expect them to work miracles and yet we howl with fury when they fail. I can see Polman's point. She definitely offers some food for thought, and the topic is worth further exploration. Whatever your stance on the UN, We Did Nothing is worth reading for Polman's writing skill alone. The book is filled with solid war reporting. The author lets the events she's describing speak for themselves - no need for emotive vocabulary, your heart will break anyway. Her account of the Kibeho Masacre, which she witnessed, is the most devastating description of a war tragedy that I've ever come across. It is absolutely brutal and stomach-turning, but I never thought much of the modern tendency to tailor war reports so that delicate constitutions of the viewing public are not unduly strained. Well, this particular report upsets, even if your skin is pretty thick. You have been warned. In short, even if at the beginning it is hard to figure out what she's trying to say, Polman's book starts well and gets better with every page.